It's that time of year when each day in the garden brings a surprise or two to the gardener. Growth and life cycles are evolving so quickly now. A bud here and a bloom there all of a sudden seemingly appears out of nowhere. 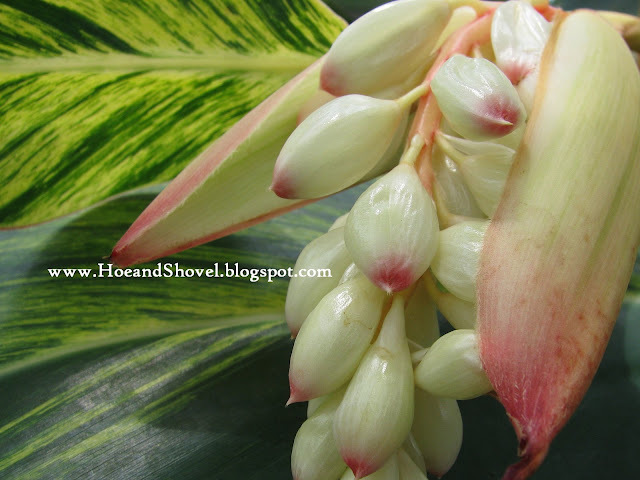 Faithful readers of Hoe and Shovel probably know how much this gardener depends on her beloved variegated shell ginger. 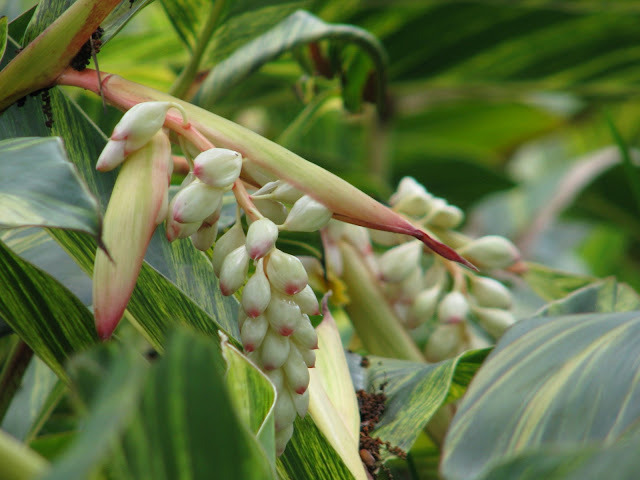 Shell ginger, Alpinia zerumbet is used here as a sort of filler layer between other tropicalesque plants both in the front and the back gardens. 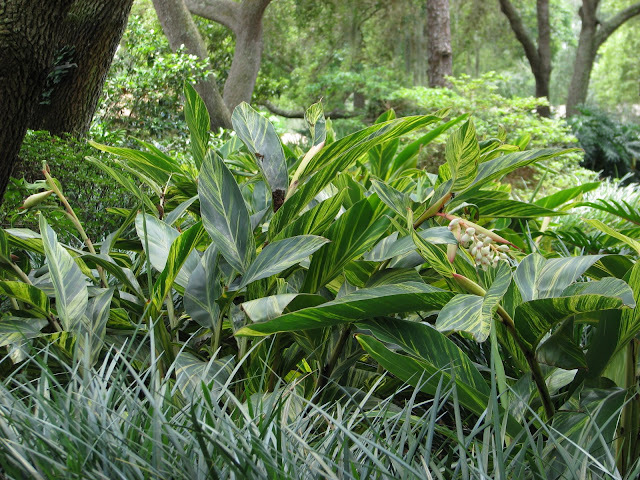 These perennial plants are tall and wide and sport very large, lengthy, stripey leaves that pick up a touch of light next to some of the darker green foliages. Easily divided and transplanted by dividing the rhizomes, they have been a well used commodity at Hoe and Shovel. Even though I expect them to bloom 'sometime in May', one can never know exactly when that will be. It's not as if I'm checking on them all the time to see if they are. Which is what makes for the surprise element when those first buds make their appearance. Just in the last few days those elongated, bulbous buds that came on so all of a sudden have burst forth into large dangling flowering forms giving way to oh, so exotic visions. May is a beautiful month. In another day or so each one of those little pink-tipped pods will pop open to further reveal the most unique yellow flower resembling things that tropical islands are made of. If you like these plants and you live in Zone 8-11, please remember not to plant them in the full sun. They will shrivel and cower there. But in dappled shade they will make you a happy gardener and last for many years. Gorgeous, Meems. I love them... Guess it's too cool up here on the plateau for them--so I'll just have to enjoy YOURS. Please keep posting them as they continue to bloom. GORGEOUS!!! I love your shell ginger! I grow my butterfly ginger (blooms in fall) up against the east side of the house, which is probably a zone 8 micro-climate. I wonder if I could grow your ginger. My confederate jasmine is blooming right now in that location and the two would be great flowering at once. Lovely, lovely garden you have! Wish we could grow this ginger yours in beautiful. 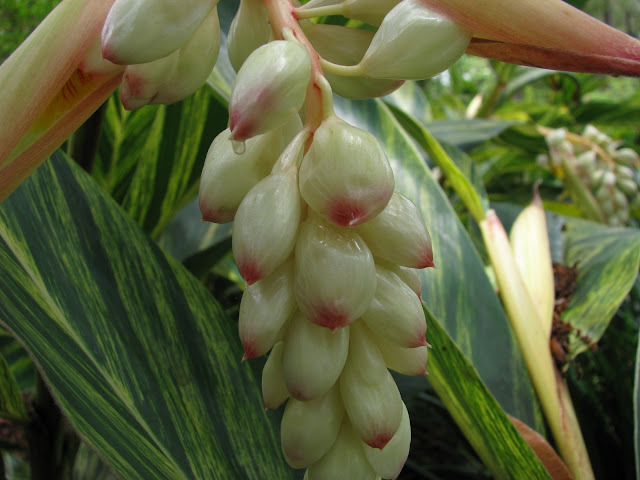 I used to have the scented ginger in the back garden, it outgrew its space and disappeared. I am wanting to get me soem of these later on. Your pictures look great and show the beautiful leaves wonderfully. Lovely and very unusual. The leaves look a little like canna. Too cool sounds really good right now at 89 degrees and humid... summer is already here it seems. Thanks for the kind words. I wonder if you could... I bet you're really enjoying that jasmine scenting the garden. Mine is just about finished dropping all its blooms. But it was stunning this year. I wish I knew what you are referring to... scented ginger? Sounds like something I'd like. 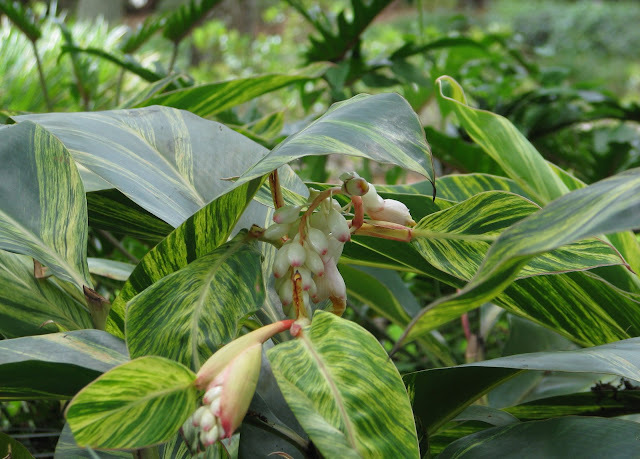 This ginger has the MOST wonderful scent when the leaves are cut or broken or crushed. Sometime I do it just to take a big sniff. Thanks. They'd do well for you... out of the sunny spots of course. I've learned that trick by default. In a big garden it dawned on me to keep using what works well... another advantage- when you place the same plant in various spots throughout the garden your eye naturally flows from one to the other. I like that in a garden design. Happy weekend to you, my friend. Those are very nice, how big do they get? Depending on where they are sited determines their size.Mine would get quite tall if I didn't trim them. A few times a year I cut out the tops (with hand pruners one by one) and completely cut at the root any spent stems. They send out new shoots from the ground and replenish themselves. Very easy to tend I'd say overall. Hi Meems! Once I got beyond those incredible blooms, I thought the same thing as Marnie ~ that the foliage resembles that of a canna. I'm sure this would have to be overwintered indoors in my zone and I am not above trying such things ~ shell ginger is gorgeous. I always marvel at what you can have in your garden and the difference latitude makes! these are simply so goodlooking...enough to eat. they are definitely tropical aren't they? something you should be very proud of.